Federal law requires that before anyone drives a vehicle with air brakes that they have passed the Air Brakes knowledge test and has the appropriate CDL license. Air Brakes are fully covered in Section 5 of the CDL manual. Air brakes use compressed air to make the brakes work. Air brakes are a good and safe way of stopping large and heavy vehicles, but the brakes must be well maintained and used properly. If you want to drive a truck or bus with air brakes, or pull a trailer with air brakes, you must be familiar with air brakes. 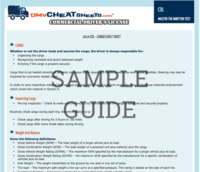 The information provided in this “cheat sheet” is designed to help you quickly and easily review all the needed topics and material for the Air Brakes knowledge test.